Our winter storytime theme is all about STEAM so I immediately thought of the Science of Food! Instead of using my old favorites including A Birthday for Cow by Jan Thomas or Too Many Pears! by Jackie French, I selected a combination of silly and informational new books. My favorite cookbook this year for all ages is Cook with Amber: Fun, Fresh Recipes to Get You in the Kitchen by Amber Kelley. It’s an engaging cookbook, perfect for tween camps at the library. Try the Fizzy Fruit or Zucchini Puffs! The Family Meals section provides a wonderful selection of recipes to try at home too. Bonus: Share one of the videos from her Cook with Amber YouTube channel. The “What’s the Science?” sections in Jane Bull’s new book, Crafty Science: More than 20 Sensational STEAM Projects for Little Makers to Create at Home is amazing! The book creates an instant library program with popcorn or cupcakes! Photographs of each step throughout the book guide children on new discoveries. What kind of fun are you cooking up in the library? It might be a make-believe play time in the Early Learning Space, a STEAM program for ages 6-11 or an interactive song about veggies at storytime. Share your favorite new food-related children’s book in the comments below. This post addresses the following ALSC Core Competencies: III. Programming Skills and IV. Knowledge, Curation, and Management of Materials. I read one this week that I am so excited about: Awâsis and the World-Famous Bannock. There’s a recipe for bannock in the back matter. The little girl is taking her grandma’s world famous bannock to a relative but in her joy-filled journey it spills out of the basket. Animals help her gather ingredients to make it again. Each animal’s name is in Cree, and it is one of the very few books, I think, that uses a gender neutral pronoun (they)! Magnificent in lots of ways. Debbie, that sounds like an excellent multicultural book, too! We don’t have it in our system, but I will ask about getting it. It sounds perfect for a DIA storytime, too! I don’t have a favorite new book about food yet, (so hard to choose! And finding what works best in storytimes for toddlers can be tricky,) but I do love food, and doing storytimes about food. Some of my favorite books to use for these are Little Pea by Amy Krouse Rosenthal – Ills. by Jen Corace; Cupcake by Charise Mericle Harper; Mouse Went Out to Get a Snack by Lyn Rossiter McFarland – Ills. by Jim McFarland; Orange Pear Apple Bear by Emily Gravett, and All for Pie, Pie for All by David Martin – Ills. by Valeri Gorbachev. As I’m writing this, it just struck me that Cupcake would be a great book to create a felt board for! I’m excited to read Jane Bull’s book mentioned in the post. I like the idea of blending STEAM with storytimes! Thank you for an inspiring post. Thank you! I’m excited to explore Awâsis and the World-Famous Bannock and appreciate your book suggestions. Wonderful! 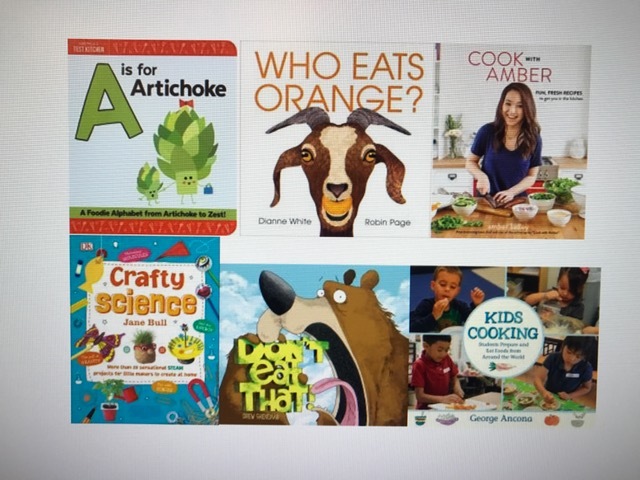 So many favorite food books to read at storytimes.